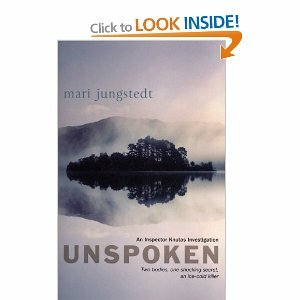 Mari Jungstedt, another crime novelist with a background as a journalist, is one of the more recent arrivals on the Scandanavian, and specifically Swedish, crime fiction scene. Her first novel, Unseen, was an assured debut and introduced us to Chief Inspector Anders Knutas. Unspoken (and you can no doubt see a theme emerging here in the titles) is the second novel of four that have been published in English in fairly rapid succession, and shows an increased confidence in the writing. One one level it is a straightforward police procedural in which Knutas and his team investigate the murder of an alcoholic photographer and the disappearance of a fourteen-year old girl. What starts off as two separate cases inevitably become linked. Some of the description and characterisation is redolent of Mankell (although Knutas is a far more subtle and functioning character than Wallander), but it lacks Mankell’s rawness and owes more, I think, to Sjowall and Wahloo. Like Martin Beck, Knutas is only one of a number of individuals who solve the case – it is a novel about the team, rather than individual – of dogged police teamwork, rather than the maverick gumshoe. I have only two minor criticisms. Firstly, as this is a UK publication of a Swedish novel, I found the consistent use of American English a slight irritant. And secondly, I felt that Jungstedt, having built the tension very nicely, rushes to finish the novel off rather too quickly. It felt like something of an abrupt ending and she could have let herself and the reader enjoy the closing pages a little more. The next two novels in the series are sitting on my bookshelf, waiting to be read, and I am already looking forward to it.